Within seconds of reclining in the scarlet leather of the Bentley Continental GT, we adopted clipped English accents in the 1930s film tradition and ordered the peasants from our path. We’re both as common as houseflies, but just couldn’t help ourselves, there’s something about a Bentley that makes you feel like an English Lord looking down at the masses. Which is really stupid. 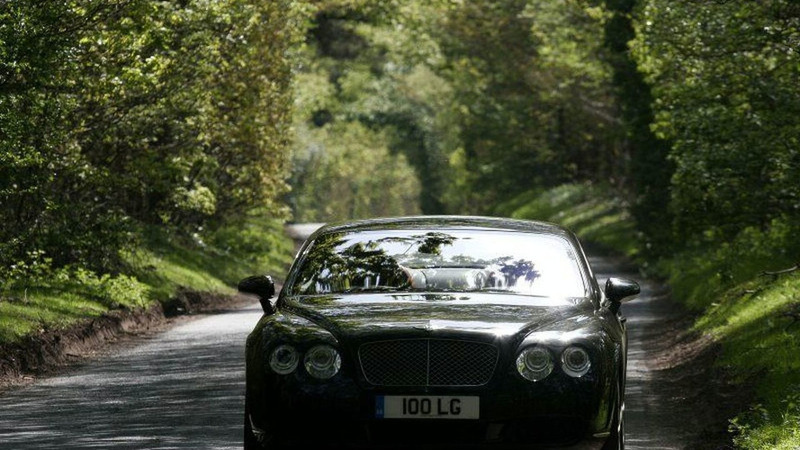 Because not only is it lower than most things on the road, the Bentley is German-owned, built in Crewe and has entered the mass market with its Continental GT. Effectively, this opulent looking creation is a Harrods branded supermarket and Bentley plans to sell 9000 units this year with the GT and Flying Spur that shares the same basic characteristics. Some production will even move to an underused VW plant in Dresden, but all British-sold Bentleys will still be built by hand in Crewe. In the past not only could you rely on Bentleys to be fast and luxurious, you could also guarantee it would be expensive and exclusive. But this model weighs in at £110,000, which isn’t quite the bargain basket at the local charity shop, but is not far beyond the reach of the average Porsche owner and the new Bentley has become a common sight on the streets of Britain in its short life. The last bastion of traditional England draws a younger crowd these days, too, which is all part of a strategy that included a return to victory at Le Mans. It has even become a surprise hit with American rappers. This car, fitted with the Mulliner package, is aimed squarely at these buyers with a sportier image courtesy of 20” wheels, drilled alloy pedals, piano black veneer and more quilting in that violent shade of leather than you’ll see at a Cotswolds craft fare. The interior comes clad in aluminium, too, if you’re into that. Directors, entrepreneurs and flash young ‘uns looking to show off their wedge could do far worse, this is a mighty potent car. It may have a Bentley badge, but this machine is firmly kitted out with the finest German engineering. And some of its worst: the Bentley comes with the same key as the VW Polo, which was more of a downer than you’d think. The 6-litre W12 engine shipped over from Audi, complete with a brace of turbos, is more than up to the job, though. It produces 551bhp at 6100rpm and masses of torque, 480lb/ft at 1600rpm. That helps drag its cumbersome 5250lb beast up to 60mph in a mighty impressive 4.7s and a top end speed of 198mph. For a car that weighs so much, that is magic on a level that even the mighty David Blaine can’t comprehend. 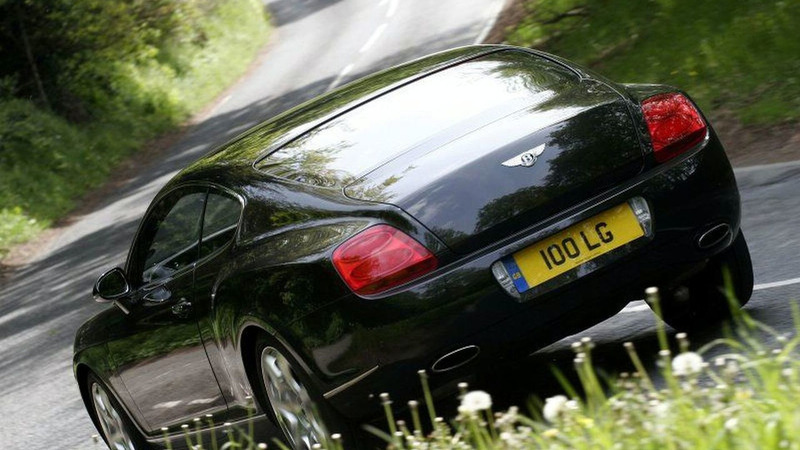 It never, ever, feels hurried either, that part of the Bentley legend has remained thoroughly intact. It may produce outrageous acceleration figures, but the only way you’d know it is by the needle swinging wildly round the rev counter. Bentley used to make the claim that the loudest noise in the cockpit was the ticking of the Breitling clock, but even that is quiet now along with every moving part of the beautifully damped interior. The W12 presents nothing more intrusive than a distant roar while the scenery blurs through the window and the driver settles into hospital room-grade padding. It acquires speed relentlessly with nothing more than a gentle push, rather than the usual kick in the back. Bentley has virtually sacrificed the rear seats with its coupe model, though, and those wanting to lounge around the back drinking Pimms while the driver does the work will go for the Flying Spur. This is by far the sexier option out of the two, however, and drags the regal Bentley design into the modern era. As for the handling, it’s all you could ask for and more in a car of this weight, but for all its overtly aggressive streamlined looks it is a technically amazing luxury car with a number of tricks to hide the weight, rather than a seat-of-the-pants racer for the road. On a spirited drive you can drop the suspension down to firm at the push of a button, change numerous other settings and ensure that you squeeze every last drop of performance from the almighty powerplant. The mid-range acceleration is ballistic, once the heavyweight is in motion it can rely on its enormous horsepower and slick aerodynamics to get the job done. Any gap in traffic is a legitimate overtaking spot and, despite there being so many in Britain, the wow factor is still high enough that people will let you past just to look at thing glide past. It sounds a lot better on the outside, too, in fact others will enjoy the engine note far more than you. Truthfully, however, there won’t be much spirited driving, as the Bentley drinks fuel like camels slurp water. Watching the range descend from 200mph fully loaded with gas to 130 miles in the space of 20 minutes, it became abundantly clear the sticker price is just part of the cost of Bentley ownership and those looking to buy one will need a hefty expense account or a flexible friend to fuel it. Drive it hard and it will melt your wallet. The speed it carries into corners, though, means the Bentley could mix it with sportscars if it ever felt the need to sully its hands, yet its ability to cover ground defies belief. It’s not the most involving drive in the world, thanks to the weight, the semi-automatic gearbox and small factory of electronics under the skin, but it’s fast, comfortable, refined and spectacular. The company may be German and the car may be cheaper, but the legacy is still alive and well. Bentley has come to the masses, but the standards are higher than ever.